The Santhal villages of Bengal and Jharkhand remain much of a mystery for most readers. Visitors to Shantiniketan admire their art and silver work or glimpse them in Satyajit Ray’s Aranyer Din Ratri. What is known is that the women are liberated, beautiful and drink haandi and that the Santhals are a very private, fiercely independent people. Hansda Sowvendra Sekhar’s debut novel takes us into the heart of the villages and into the stories behind their lives. Witchcraft or dahni-bidya is rife and women are rumoured to feast on human livers. In the middle of this comes the story of Rupi Baskey who delivers a child in the paddy field – an opening that reminds me of another novel, possibly Sarita Mandanna’s Tiger Hills, but one which seems to work here, though the story of Rupi gets diverted to the back story of her family, her step mother and her mother in law Purki. Purki is a beautiful high spirited girl who with her friend Della meets young men outside the village and enjoys herself. Della comes from a witch’s family but marries the man of her choice and disappears from the narrative. Purki marries unexpectedly according to her family’s wishes, the short legged Khorda-haram who manages the village, and has two sons Sido and Doso and becomes Rupi Baskey’s mother in law. Rupi’s marriage seems to be afflicted by the black magic of another woman who is having an affair with Sido as a result of which she falls into the strange malady. Occasionally Rupi seems to be too good to be true, determined not to put anyone out and helpless when confronted with stronger personalities. Her mother in law, Purki sees Rupi’s fate as a kind of punishment for her drinking but continues to lose herself in haandi. Three generations of Baskeys are dogged by ghosts, spirit sightings in the night and ojhas and by the cross currents between neighbours and family members which makes them more and more dysfunctional. Values and relationships can be tricky things to maintain, especially when old and new ways of life collide and the old beliefs overpower the new. The peppering of Santhal dialect tends to make the text difficult to navigate though yes, it does add to the flavour and the meanings in English have been given with great care. Sekhar delves into the details of village life, the dogor tree which is both beautiful and accursed, the way in which Santhal belles dress and the different dialects in which they talk. The story is based on a real life rumour that he once heard about a village curse and in bold sweeps he follows it through. Occasionally the book does ramble and one wonders where Purki’s friend vanished and why she was brought into the story at all. Some of Rupi’s life and the mystery of her ailment too seems to go on for too long. What makes the difference are the vividly drawn witchcraft scenes and the unfamiliar tribal mores – for most Indian readers this is a new world and one which is still untouched by the 21st century. Tribal villages on the borders of Jharkhand and West Bengal are not places which one usually visits – and refreshingly there is no mention of Maoists or political crises. It is straight from the red dark earth and told from the heart. 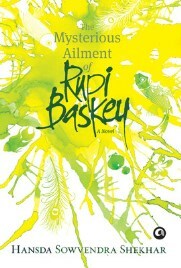 No Comments on "The Mysterious Ailment of Rupi Baskey"